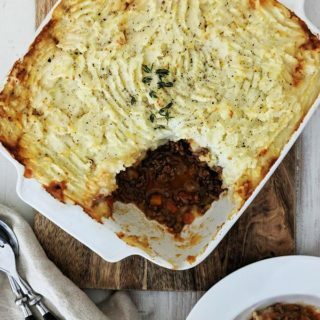 This tasty & comforting Cottage Pie is just 6 SmartPoints per portion on Weight Watchers Freestyle plan. It’s easy to prepare ahead, chill then bake later for dinner. In my mind that’s what makes a great WW dinner recipe. Oh, and it’s freezer friendly too! 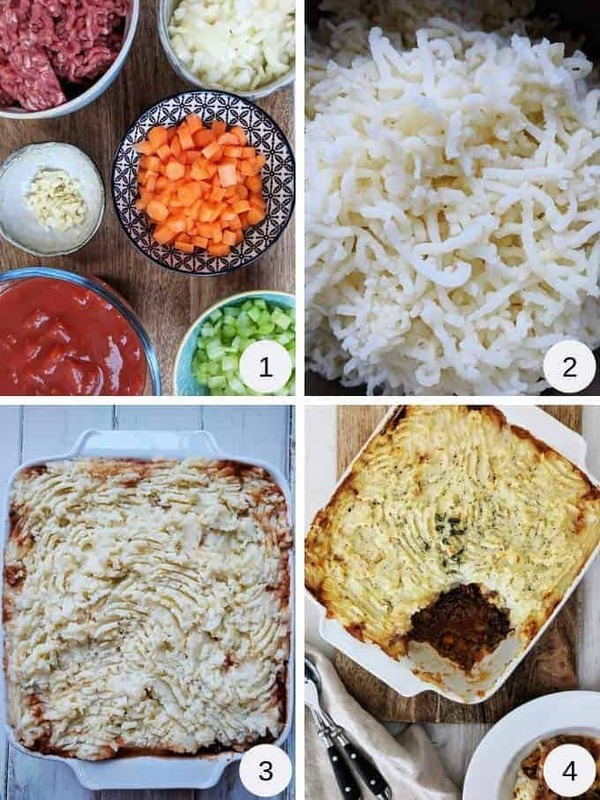 If you are looking for comfort food, you can’t go wrong with Cottage Pie! 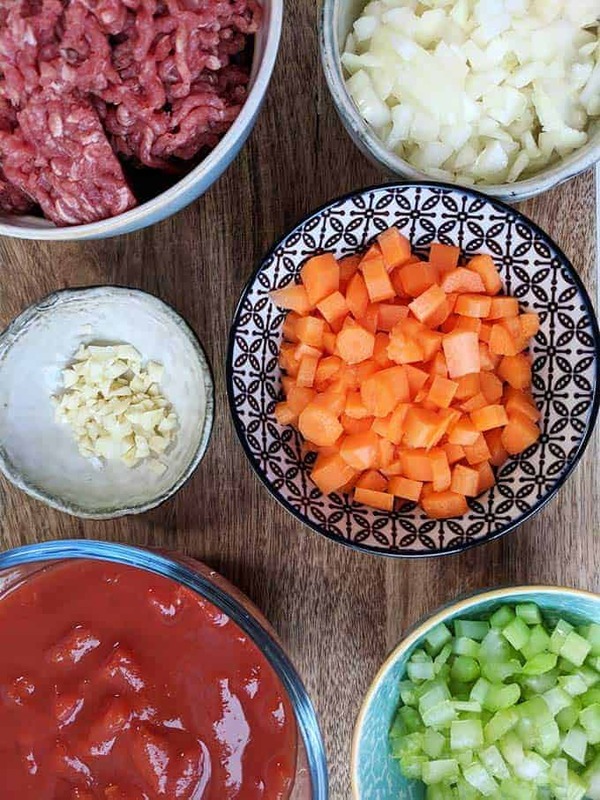 It’s a British classic of minced beef / ground beef, cooked with onions, carrots, celery and a tomatoey gravy. It’s then topped with fluffy, smooth, mashed potatoes. I used 5% fat mince beef (extra lean ground beef) in this recipe, yet you really wouldn’t guess that it’s low fat. By using extra lean beef mince (rather than ‘normal’ mince) you reduce the Points by 4 SmartPoints per portion. Place the potatoes in cold, salted water and bring to the boil. Then reduce the heat and simmer for 15 – 20 minutes. If you are in the USA, starchy potatoes such as Russets or Yukon Golds make for the best fluffiest mash potatoes. If you are in the UK go for Maris Pipers, Desiree or King Edward varieties for a perfect fluffy mash. I add a bit of half fat butter (for flavour) and some skimmed milk to loosen it up for a creamier, easy to spread mashed potato. Season well (although by using salted water to cook the potatoes in, they shouldn’t need much more salt). I find it easiest to put the cooked potatoes through a potato ricer (I don’t like lumps!) but use a potato masher (or fork) if you prefer. Use a potato ricer like this one, available from Amazon, for super smooth mash potatoes. Chop all of your ingredients before starting (pic 1). It makes it so much easier. Use a potato ricer for super smooth mashed potatoes (pic 2). Use a fork to spread the mashed potato over the meat mixture. You can then run the fork gently through the mashed potato to fluff it up (pic 3). Bake until the potato has turned golden brown (pic 4). What do you mean by de-glazing the pan? When you saute food in a little oil, you often get brown bits sticking to the bottom of the pan. As long as they are not burnt to the pan, these bits have a lot of flavour. By adding a little cold liquid (water, vinegar, wine etc) to the bottom of the hot pan, you can scrape these bits off the bottom to add to the overall flavour of the dish. It is important, however, not to try to de-glaze the pan if the bits on the bottom are blackened as this will just add a burnt overall flavour to your dish! 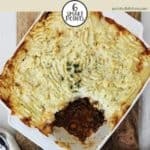 What should I serve with this Cottage Pie? Serve it just as it is or with garden peas or sweetcorn if you prefer. Can I freeze this Cottage Pie? The Cottage Pie will freeze well, in an airtight container, for up to 3 months. Make the pie, then freeze it before baking. When you want to eat it remove it from the freezer, thaw it then bake it for dinner! If you want to freeze left over portions of this pie, portion them up in containers with airtight lids like these , then freeze for up to 3 months. You can then remove a portion from the freezer when required, thaw it and it cook through for an easy meal. 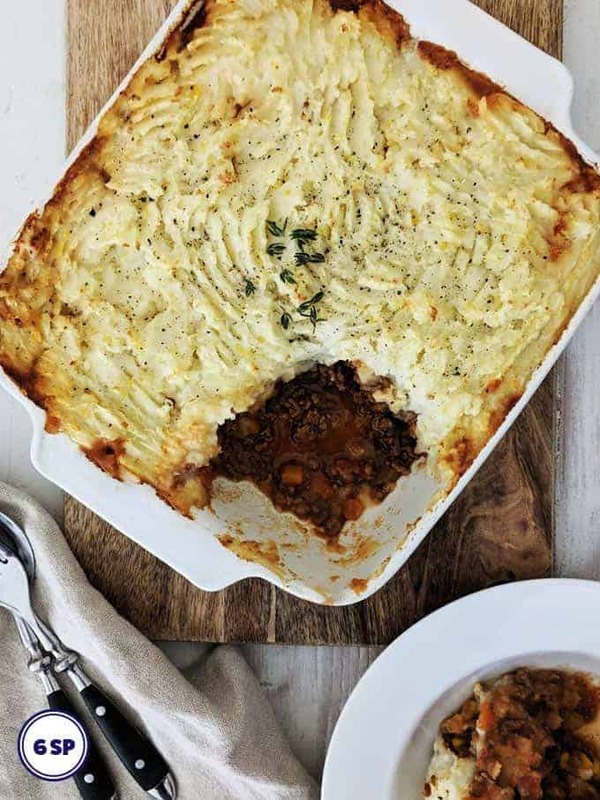 This tasty Cottage Pie is a tasty & comforting low SmartPoint dinner. Just 6 SmartPoints per portion on Weight Watchers Freestyle plan. Place the chopped potatoes in a saucepan of salted cold water. Bring to the boil, reduce the heat and simmer for 15 - 20 minutes or until they are cooked through and soft when pierced with a knife. Drain well and set aside for later. Meanwhile, spray the bottom of a large saucepan with Frylight/ Pam (10 - 15 pumps). Place over a medium heat and add the chopped onion, carrots, celery and garlic. Saute for about 8 - 10 minutes, until the onions are translucent and the carrots have softened. Add the red wine vinegar to de-glaze the pan (see notes in post). Add the mince beef / ground beef and cook for 5 - 6 minutes until it has browned. Add the tomato puree, Worcestershire sauce, tin of tomatoes, beef stock and bay leaves and stir to combine. Bring to the boil, then reduce the heat and leave to simmer for 15 - 20 minutes, stirring occasionally. Mash the potatoes with the half fat butter and the milk. Season with salt and pepper. Once cooked, spoon the mince beef / ground beef mixture into a casserole dish. Dot spoonfuls of the mashed potato on top of the beef mixture and use a fork to spread it evenly over the top. Bake for 30 - 35 minutes or until the potato have turned golden brown. Serve on its own or with garden peas or sweetcorn if you prefer. Hi, I was wondering what size casserole dish to use for this recipe? Thanks! Hi Stephanie. Sorry for the delay in my reply. I used an 8 inch x 8 inch casserole for this dish. I think you would struggle to use anything bigger as the potato topping would have to be spread too thinly. I hope that that helps!